What's on your "Bucket List?" Carol, congratulations on your eagle shots. They look very good to me: nice composition on both. I'd love to see them at full size. I hope you shot the sunset at Cadillac Mountain. Enjoy your trip. I have many things on my "bucket list." Two of them are: 1 - Shoot the Split Rock Lighthouse, and 2 - Finally get to meet my good friend Al -- Both are going to happen this month! At the end of the month, I fly into Minneapolis to spend a long weekend shooting the Minnesota "North Shore" with Al and our now mutual friend, Rich. And, we have Al as our guide. If Mother Nature cooperates, we cannot miss! autzig wrote: Carol, congratulations on your eagle shots. They look very good to me: nice composition on both. I'd love to see them at full size. I hope you shot the sunset at Cadillac Mountain. Enjoy your trip. Thanks Al! We never made it up to Cadillac Mtn on this trip, believe it or not. Went up twice when I was there in the Fall though. Andy wrote: I have many things on my "bucket list." Two of them are: 1 - Shoot the Split Rock Lighthouse, and 2 - Finally get to meet my good friend Al -- Both are going to happen this month! At the end of the month, I fly into Minneapolis to spend a long weekend shooting the Minnesota "North Shore" with Al and our now mutual friend, Rich. And, we have Al as our guide. If Mother Nature cooperates, we cannot miss! You are going to have a wonderful time Andy...........I so enjoyed shooting with Al last Fall in Vermont. One more thing on my bucket list is shooting with both you and Al and the way things are looking, I think I'm going to be crossing that one off my list this year. Really looking forward to it. Re: What's on your "Bucket List?" 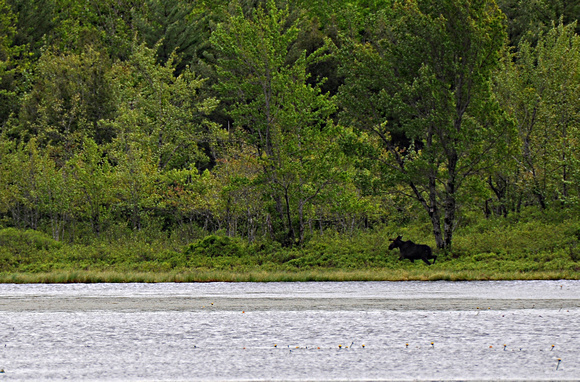 My 300 mm lens was not long enough, as this guy was a long distance across the pond. 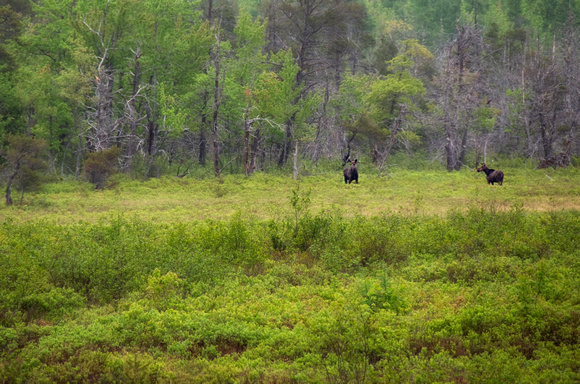 BUT, it was great to see him in his natural environment and to be able to make some behavioral images. The light was flat, as it was an overcast day. 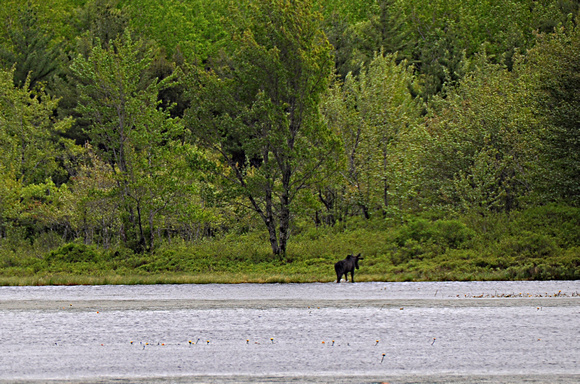 The following day we spotted these two cows, but they were very far away feeding in a boggy area. I was pleased to be able to incorporate them in a landscape image though. Now one may need a magnifying glass to see them......but that's ok.
Beautiful shots Carol!!!! Lucky you! 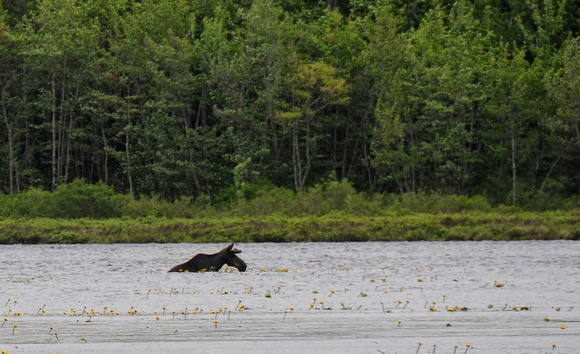 Love the pond photo of the moose the best! Thanks CT! I actually was thinking about you when I was on this trip. You would have loved it! When I first saw him, he was standing like a statue in the back yard - about 40 feet from the door i had opened. he then wandered around the barn and up 100A to the front of the house where we went outside to try and see him - again, he was about 30-40 feet from us! After we got a good view (and no photos) he turned around walked back down the center of the road and then over the railing and into the woods! They ARE amazing animals and I am looking forward to seeing your 'dream shot' one day!! 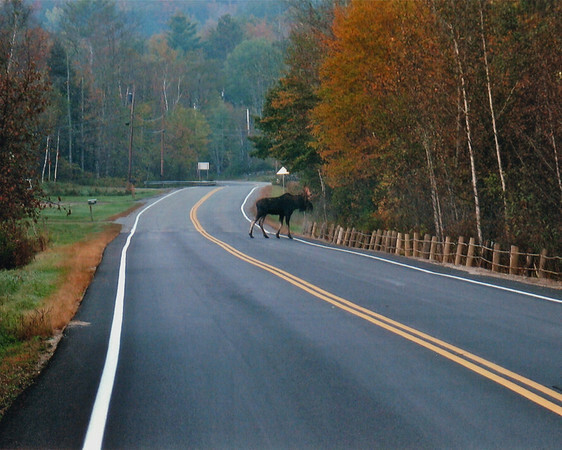 Thanks for sharing your moose shot MMVT. I know exactly what you mean about it being embedded in your memory. I have lots of those too and they are cool memories to have!!! Topic - What's on your "Bucket List?"